The Mekong is one of Asia’s major rivers, and the twelfth longest in the world. Sometimes called the ‘Danube of the East’, it nurtures a great deal of life in its waters – and in the wetlands, forests, towns and villages along its path. The Mekong’s long journey begins in the Tibetan highlands. It flows through China’s Yunan province, and then across Burma, Thailand, Laos and Cambodia…before entering the sea from southern Vietnam. It’s a journey of nearly 5,000 kilometres, or some 3,000 miles. The Mekong River Basin is the land surrounding all the streams and rivers that flow into it. This covers a vast area roughly the size of France and Germany combined. On its long journey across 6 countries, the Mekong provides a life-line to over 65 million people. They share Mekong waters for drinking, farming, fishing and industry. 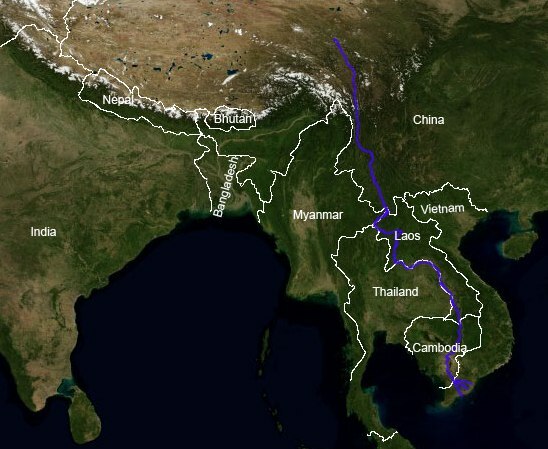 Along the way, the river also generates electricity for South East Asia’s emerging economies. Naturally, these teeming millions who share the river feel differently about how best to manage the river waters in their best interests. The Mekong River Commission (MRC) tries to nurture cooperation among the Mekong river countries, but differences still remain. At the centre of this debate was Pipope Panitchpakdi, my Thai film-maker friend who recently made the documentary Mekong: The Untamed. He is both an outstanding journalist and an outspoken media activist. Mekong: The Untamed chronicles the journey of Suthichai Yoon, a leading Thai media personality, from the headwaters of the Mekong River in Tibet to the Mekong Delta in Vietnam. The question he seeks to answer through his travels is how the planned Chinese dams affect communities who live along the banks of the river. “My Mekong journey goes to the heart of Asia’s complexities,” says the narrator as he makes his way from China’s southern province of Yunnan to the north-eastern Thai town of Chiang Khong. The scenes he passes range from the raging waters of the Mekong and hills swathed with mist to riverside communities being torn apart by a building frenzy. “I wonder if the Chinese realise what the people who are impacted by the dam feel?” Suthichai asks at one point. This second film, also showcased at the Mekong Media Forum, is a 20-episode series titled Nourished by the Same River, and has been made by China Central Television (CCTV). The Mekong is both a mighty river and a massive bundle of issues for any film or film series to tackle. And given the multitude of countries, interests and viewpoints involved, it’s unlikely that there will be consensus. But it’s good that films are sparking off discussion and debate…just what we need for more informed choices to be made in the future.